Jamasb, Ali, Motavalli-Anbaran, Seyed-Hani. (1396). Non-linear stochastic inversion of regional Bouguer anomalies by means of Particle Swarm Optimization: Application to the Zagros Mountains. مجله ژئوفیزیک ایران, 10(5), 10-21. Ali Jamasb; Seyed-Hani Motavalli-Anbaran. "Non-linear stochastic inversion of regional Bouguer anomalies by means of Particle Swarm Optimization: Application to the Zagros Mountains". مجله ژئوفیزیک ایران, 10, 5, 1396, 10-21. Jamasb, Ali, Motavalli-Anbaran, Seyed-Hani. (1396). 'Non-linear stochastic inversion of regional Bouguer anomalies by means of Particle Swarm Optimization: Application to the Zagros Mountains', مجله ژئوفیزیک ایران, 10(5), pp. 10-21. Jamasb, Ali, Motavalli-Anbaran, Seyed-Hani. Non-linear stochastic inversion of regional Bouguer anomalies by means of Particle Swarm Optimization: Application to the Zagros Mountains. مجله ژئوفیزیک ایران, 1396; 10(5): 10-21. Estimating the lateral depth variations of the Earth’s crust from gravity data is a non-linear ill-posed problem. The ill-posedness of the problem is due to the presence of noise in the data, and also the non-uniqueness of the problem. Particle Swarm Optimization (PSO) is a stochastic population-based optimizer, originally inspired by the social behavior of fish schools and bird flocks. PSO is a global search method, meaning that it has the ability to escape local minima. In addition, PSO is an iterative method, wherein an initial solution is chosen randomly and then improved iteratively until the algorithm finds a solution close enough to the global minimum. Herein, the inverse problem of estimating the thickness of the crust from gravity anomalies is formulated as a single objective optimization problem and is solved by PSO. The method is first tested on a realistic synthetic crustal model both with and without the presence of white Gaussian noise (WGN). Then it is applied to the gravity data from EIGEN-6c4, the latest combined global gravity model, in order to find the base of the crust in the Zagros Mountains (Iran) and compare the results with those of other geophysical methods. The assumed crustal model is one with a linear density gradient in which the densities at both the surface and the base of the crust are fixed. Results agree well with the previously published works including both seismic and potential field studies. Afonso, J. C., Fernández, M., Ranalli, G., Griffin, W., and Connolly, J., 2008, Integrated geophysical–petrological modeling of the lithosphere and sublithospheric upper mantle: Methodology and applications: Geochemistry, Geophysics, Geosystems, 9 (5), 1–36. Aitken, A. R. A., Salmon, M. L., and Kennett, B. L. N., 2013, Australia's Moho: A test of the usefulness of gravity modelling for the determination of Moho depth: Tectonophysics, 609, 468–479. Al-Lazki, A. I., Al-Damegh, K. S., El-Hadidy, S. Y., Ghods, A., and Tatar, M., 2014, Pn-velocity structure beneath Arabia–Eurasia Zagros collision and Makran subduction zones: Geological Society, London, Special Publications, 392, 45–60. Al-Lazki, A. I., Sandvol, E., Seber, D., Barazangi, M., Turkelli, N., and Mohamad, R., 2004, Pn tomographic imaging of mantle lid velocity and anisotropy at the junction of the Arabian, Eurasian and African plates: Geophys. J. Int., 158, 1024–1040. Angeline, P. J., 1998, Using selection to improve particle swarm optimization: paper presented at Proceedings of IEEE International Conference on Evolutionary Computation, Citeseer. Bäck, T., 1996, Evolutionary Algorithms in Theory and Practice: Evolution Strategies, Evolutionary Programming, Genetic Algorithms: Oxford University Press, 328 pp. Bäck, T., and Schwefel, H.-P., 1993, An overview of evolutionary algorithms for parameter optimization: Evolutionary Computation, 1, 1–23. Barazangi, M., Sandvol, E., and Seber, D., 2006, Structure and tectonic evolution of the Anatolian plateau in eastern Turkey: Geological Society of America Special Papers, 409, 463–473. Berberian, M., 1995, Master “blind” thrust faults hidden under the Zagros folds: active basement tectonics and surface morphotectonics: Tectonophysics, 241, 193–224. Bott, M., 1960, The use of rapid digital computing methods for direct gravity interpretation of sedimentary basins: Geophys. J. Int., 3, 63–67. Bott, M., 1965, The upper mantle beneath Iceland: Geophys. J. Int., 9, 275–277. Corchete, V., Chourak, M., and Khattach, D., 2010, A methodology for filtering and inversion of gravity data: an example of application to the determination of the Moho undulation in Morocco: Engineering, 2, 149–159. Cordell, L., 1973, Gravity analysis using an exponential density-depth function—San Jacinto Graben, California: Geophysics, 38, 684–690. Čuma, M., Wilson, G. A., and Zhdanov, M. S., 2012, Large-scale 3D inversion of potential field data: Geophys. Prospect., 60, 1186–1199. Dewey, J., Hempton, M., Kidd, W., Saroglu, F. T., and Şengör, A., 1986, Shortening of continental lithosphere: the neotectonics of Eastern Anatolia—a young collision zone: Geological Society, London, Special Publications, 19, 1–36. Dorigo, M., Maniezzo, V., and Colorni, A., 1996, Ant system: optimization by a colony of cooperating agents: IEEE Transactions on Systems, Man, and Cybernetics, Part B: Cybernetics, 26, 29–41. Eberhart, R. C., and Kennedy, J., 1995, A new optimizer using particle swarm theory: Proceedings of the 6th International Symposium on Micro Machine and Human Science, New York, NY. 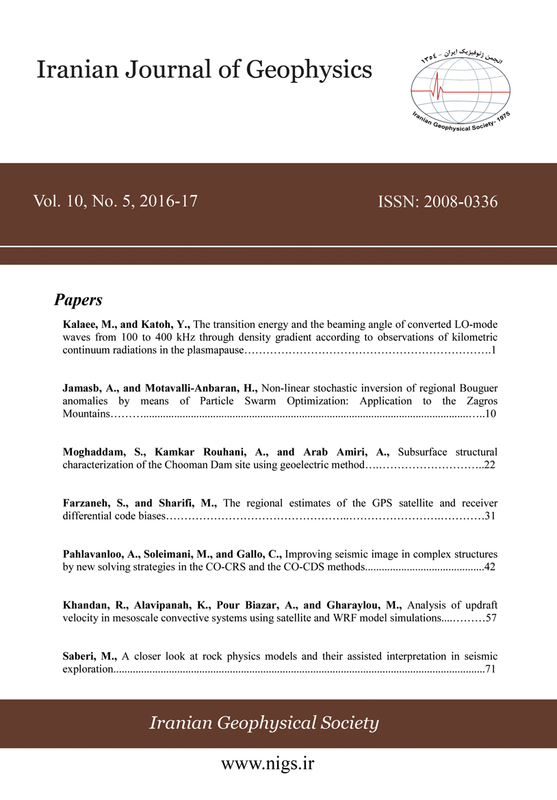 Förste, C., Bruinsma, S., Abrikosov, O., Flechtner, F., Marty, J.-C., Lemoine, J.-M., Dahle, C., Neumayer, H., Barthelmes, F., and König, R., 2014, EIGEN-6C4 The latest combined global gravity field model including GOCE data up to degree and order 1949 of GFZ Potsdam and GRGS Toulouse: EGU General Assembly Conference Abstracts. Gallardo-Delgado, L. A., Pérez-Flores, M. A., and Gómez-Treviño, E., 2003, A versatile algorithm for joint 3D inversion of gravity and magnetic data: Geophysics, 68, 949–959. Garnier, S., Gautrais, J., and Theraulaz, G., 2007, The biological principles of swarm intelligence: Swarm Intelligence, 1, 3–31. Gómez-Ortiz, D., Agarwal, B., Tejero, R., and Ruiz, J., 2011, Crustal structure from gravity signatures in the Iberian Peninsula: Geological Society of America Bulletin, 123, 1247–1257. Gonzalez, T. F., 2007, Handbook of Approximation Algorithms and Metaheuristics: CRC Press, 1432 pp. Gould, S. J., 2002, The Structure of Evolutionary Theory: Harvard University Press, 1464 pp. Grad, M., and Tiira, T., 2009, The Moho depth map of the European Plate: Geophys. J. Int., 176, 279–292. Grad, M., and Tiira, T., 2012, Moho depth of the European Plate from teleseismic receiver functions: J. Seismology, 16, 95–105. Hafkenscheid, E., Wortel, M., and Spakman, W., 2006, Subduction history of the Tethyan region derived from seismic tomography and tectonic reconstructions: J. Geophys. Res., Solid Earth, 111, B08401, doi: 10.1029/2005JB003791. Hatzfeld, D., Tatar, M., Priestley, K., and Ghafory-Ashtiany, M., 2003, Seismological constraints on the crustal structure beneath the Zagros Mountain belt (Iran): Geophys. J. Int., 155, 403–410. Kennedy, J., Kennedy, J. F., Eberhart, R. C., and Shi, Y., 2001, Swarm Intelligence: Morgan Kaufmann, 512 pp. Liu, S., Hu, X., and Liu, T., 2014, A stochastic inversion method for potential field data: ant colony optimization: Pure and Applied Geophysics, 171, 1531–1555. Manaman, N. S., and Shomali, H., 2010, Upper mantle S-velocity structure and Moho depth variations across Zagros belt, Arabian–Eurasian plate boundary: Physics of the Earth and Planetary Interiors, 180, 92–103. Manaman, N. S., Shomali, H., and Koyi, H., 2011, New constraints on upper-mantle S-velocity structure and crustal thickness of the Iranian plateau using partitioned waveform inversion: Geophys. J. Int., 184, 247–267. Molinaro, M., Zeyen, H., and Laurencin, X., 2005, Lithospheric structure beneath the south-eastern Zagros Mountains, Iran: recent slab break-off? : Terra Nova, 17, 1–6. Monteiro Santos, F. A., 2010, Inversion of self-potential of idealized bodies’ anomalies using particle swarm optimization: Computers & Geosciences, 36, 1185–1190. Motavalli-Anbaran, S.-H., Zeyen, H., and Ardestani, V. E., 2013, 3D joint inversion modeling of the lithospheric density structure based on gravity, geoid and topography data—Application to the Alborz Mountains (Iran) and South Caspian Basin region: Tectonophysics, 586, 192–205. Motavalli-Anbaran, S.-H., Zeyen, H., and Jamasb, A., 2016, 3D crustal and lithospheric model of the Arabia–Eurasia collision zone: J. Asian Earth Sciences, 122, 158–167. Motavalli-Anbaran, S. H., Zeyen, H., Brunet, M. F., and Ardestani, V. E., 2011, Crustal and lithospheric structure of the Alborz Mountains, Iran, and surrounding areas from integrated geophysical modeling: Tectonics, 30, TC5012, doi: 10.1029/2011TC002934. Mutlu, A. K., and Karabulut, H., 2011, Anisotropic Pn tomography of Turkey and adjacent regions: Geophys. J. Int., 187, 1743–1758. Pavlis, N. K., Holmes, S. A., Kenyon, S. C., and Factor, J. K., 2012, The development and evaluation of the Earth Gravitational Model 2008 (EGM2008): J. Geophys. Res., 117, B04406, doi: 10.1029/2011JB008916. Rao, C. V., Raju, M., and Chakravarthi, V., 1995, Gravity modelling of an interface above which the density contrast decreases hyperbolically with depth: J. Applied Geophys., 34, 63–67. Rao, D. B., 1990, Analysis of gravity anomalies of sedimentary basins by an asymmetrical trapezoidal model with quadratic density function: Geophysics, 55, 226–231. Sen, M. K., and Stoffa, P. L., 2013, Global Optimization Methods in Geophysical Inversion: Cambridge University Press, 302 pp. Shaw, R., and Srivastava, S., 2007, Particle swarm optimization: A new tool to invert geophysical data: Geophysics, 72, F75–F83. Shi, Y., and Eberhart, R., 1998, A modified particle swarm optimizer: Evolutionary Computation Proceedings, IEEE World Congress on Computational Intelligence, The 1998 IEEE International Conference. Silva, J. B., Santos, D. F., and Gomes, K. P., 2014, Fast gravity inversion of basement relief: Geophysics, 79, G79–G91. Srivastava, S., and Agarwal, B. N. P., 2010, Inversion of the amplitude of the two-dimensional analytic signal of the magnetic anomaly by the particle swarm optimization technique: Geophys. J. Int., 182, 652–662. Wessel, P., Smith, W. H., Scharroo, R., Luis, J., and Wobbe, F., 2013, Generic mapping tools: improved version released: Eos. Trans. AGU, 94, 409–410. Zeyen, H., and Pous, J., 1993, 3-D joint inversion of magnetic and gravimetric data with a priori information: Geophys. J. Int., 112, 244–256. Zhdanov, M. S., 2002, Geophysical Inverse Theory and Regularization Problems: Elsevier, 633 pp.